It was a rare moment of luck for me. I found my Italian troops in possession of key terrain that turned out be the quintessential defile. Combat Mission Fortress Italy has been out since two weeks already. It was about time for me to try it out so I basically suspended my life yesterday and played it like there was no tomorrow. This is a microscopic story of one of the scenarios that I played. I will limit this entry to what you will read below because I don't want to spoil the whole scenario for you. The scenario is one of the single player fictional missions in Combat Mission Fortress Italy. The 2nd US Armored Division needs to clear alternate routes of advance and are heading directly towards the Italian troops under my command. I can't complain about my assets, which includes plenty of infantry a handful of light tanks, AT guns and mortars. The terrain is treacherous for the attackers. A river bed crossed by sturdy stone bridges that shoot roads in every direction. The hollow of the narrow valley is surrounded by dense forest. It's hard to imagine a better kill zone. One of the two bridges is the subject of this story. It is a 10+ meter long stone construction that can hold the heaviest of tanks (maybe that's why the 2nd US Armored Division wants it?). Ages-old trees stand at the entrance and the exit of the bridge, like warriors protecting us against the enemy's line of sight. I'm holding this bridge with an Italian rifle squad and an R-35 light infantry tank. An aerial view of the bridge. There is a bit of confusion regarding the composition of an Italian Army squad: it is actually composed of two groups (rifle and MG). The game labels each group as "squads". This is just a minor misnaming issue that doesn't affect gameplay. I placed the MG group on near side of the bridge and the rifle group on the right side. I wanted to avoid the US troops (green icons in the houses across the river) to be able to target anything until they were near the bridge entrance. 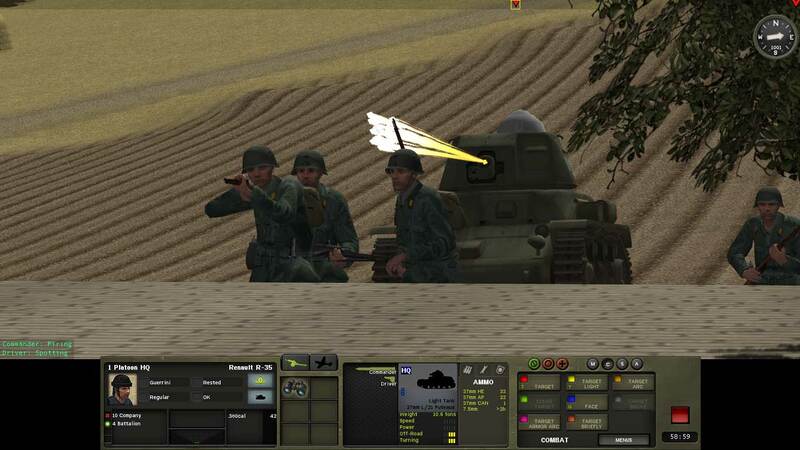 The R-35 light infantry tank is also shown, ready to provide fire support. Sottotenente (2nd Lieutenant) Cirillo Guerrini, a tough man who goes by the nickname "bambino" (the kid) because for his small complexion (that physical attribute came in handy for his career as a tanker) is chewing some stale bread topped with two garlic cloves and wild mint leaves he found near the river bed (those ingredients did not make him a great companion for his tank driver). He is checking the 37 mm main gun just one last time. He has his tank in a hull down position, with a narrow field of fire in front of him. Attenzione! First shots in the bridge, seen from the enemy side. One of the MGs is in the front of the R-35. I don't know if it is too wise to have that ordnance flying over your head. The Americans are showing up in halftracks and receive an unwelcoming reception from my troops (background, far side of the bridge. Confusion among the attackers. An American halftrack just lost his gunner and the driver is trying to get out of harm's way. Guerrini's R-35 is holding the line. Note how the MG team in front of the tank is pinned down and taking casualties. After my MG team was eliminated, the Americans took advantage of the relatively low rate of fire of the R-35's main gun and assaulted the bridge. It was a massacre. A grenade just exploded in the left track of the tank, leaving it immobile. A panoramic view of the bridge. A second halftrack attempted to cross and suffered the same fate. Eventually, the American's stopped their attempts to force a crossing. Here is Guerrini's light tank, immobile but with a lot of ammunition left. The whole scenario likely gravitated around this bridge. Not that everything that happened was what is shown here. The left flank of this defensive position was in peril more than once. But that's stuff for another story. This expansion looks nice. Is that R35 firing canister in the first action shot against the halftrack? Nasty. Glad to see you placed an R35 at the foot of the bridge/.. I did the same.. bugger of a position for the US player to take. @ smith: I don't know what was that either. It was falling pretty dispersed on the distant targets, as seen in one of the screenshots. I'm looking forward to picking this up when I have the cash. I just hope the Italians don't fight like the Syrians did in Shock Force. Are the CLNAI in the expansion? I'd love to command Eugenio Corti's artillery units and watch the Nembo paras storm up into cities.